Raven Georgia Wall Map from Omnimap, the world's leading international map store. Mounting and framing options: click here for sample images. 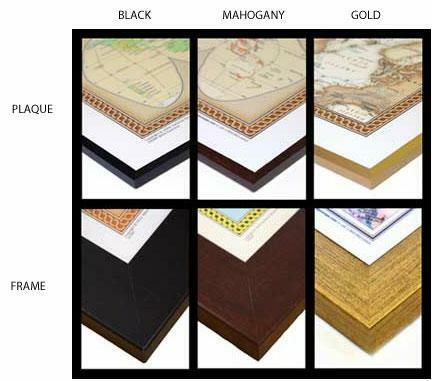 We offer maps in three mounted formats; "plaque" mounted on wood; mounted on soft wood or foam core for use with map pins; or mounted on a magnetic metal sheet. The Plaque-mounted version features a cutting edge mounting process which permanently bonds the laminated map to a 3/8" MDF board. The edges are then beveled and sealed with a decorative edge color. Color choices are Black, Mahogany, and Gold. The pin-board version features the same mounting process which permanently bonds the laminated map to a 3/8" Low Density Fiber board. This mounting process will allow the use of push pins to mark your favorite destinations. The map is then finished with a beautiful 3" wide wood frame which is crafted from 100% reclaimed wood fiber and available in Black, Mahogany, and Gold finishes. Magnetic Mounting features mounting the map on a thin magnetic metal sheet. Georgia Raven Shaded Relief Map. 1:500,000. Raven Maps. The state of Georgia lies between the Chattahoochee and the Savannah Rivers, and the Blue Ridge Mountains and the Atlantic Ocean. The plains, the hilly piedmont, and even the Appalachian Plateau in the northwestern corner are all depicted in delicate shades of brown and green, with each color representing a different elevation. This, in combination with our relief shading technique, gives the map a 3-dimensional look. Size is 40 x 45". Samples of the plaque mounts and framed mounts. 3/4" brushed aluminum frame. 3/4" brushed aluminum frame, available on either pin-board mount or magnetic mount. Thumbnail of a map with the 3/4" aluminum frame. Sample detail of a map with the 3/4" aluminum frame. 4" brushed aluminum frame. 4" wide brushed aluminum frame. Thumbnail of a map with the 4" aluminum frame. Sample detail of a map with the 4" aluminum frame. Map Pins & Map Dots for use with Wall Maps! Click here to see our listings of map pins, map tacks, and transparent map dots, all for use with wall maps.